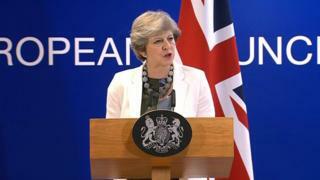 Image caption Theresa May emphasised Northern Ireland's "unique circumstances"
The prime minister has repeated that the unique circumstances of NI will require a specific Brexit solution. Theresa May was speaking in Brussels after a meeting of EU leaders. "It is vital that joint work on the peace process is not affected in any way, it is too important for that," she said. In their summit conclusions, the EU leaders said there was "some progress" on protecting the Good Friday Agreement and Common Travel Area. They said these principles would need "further refinement.". They added that they expect the UK to '"present and commit to'" flexible and imaginative solutions called for by Ireland's unique situation. Mrs May said the EU and UK were both agreed there could be no "physical infrastructure" on the Irish border. Image caption Taoiseach Leo Varadkar said Mrs May's contribution had been "very positive"
The Irish prime minister has described Mrs May's contribution at the EU leaders meeting as "very positive". At a working dinner on Thursday, Mrs May urged EU leaders to create a dynamic in Brexit talks that "enables us to move forward together". Taoiseach Leo Varadkar said she had specifically referenced the unique situation in both the Republic of Ireland and Northern Ireland. He said she had strengthened her language about avoiding a hard border. Speaking at the European Council in Brussels, the taoiseach repeated his call for the UK to provide more detail on how it will maintain an infrastructure-free border when it leaves the customs union and single market. Mr Varadkar said he would miss the UK when it leaves, praising Mrs May's "strong interventions" on taxation of the digital economy which he said was "very much in line" with Irish thinking. Ireland wants taxation of digital firms to happen as part of a global approach rather than an EU-only initiative. The UK prime minister wanted to move onto trade talks and, on Friday morning, European Council president Donald Tusk said leaders of the 27 remaining EU states had given the green light to preparations for the second phase of Brexit talks, dealing with trade. The international trade secretary, Liam Fox, has held separate meetings at Stormont with the DUP and Sinn Féin. Sinn Féin's Michelle O'Neill said she told Dr Fox that what she called "the Tory Brexit agenda" would have disastrous consequences for the Good Friday Agreement and for Ireland, north and south. DUP leader Arlene Foster said: "As we prepare for the UK leaving the EU and the trading opportunities it will present, we will continue to liaise with the secretary of state as to how we in Northern Ireland can play a full role in a globally focused United Kingdom."